The iconography of Nepalese Hinduism is essentially the same as that of Indian Hinduism. There are, however, some important differences between them. One of the most important difference is that Nepalese Hinduism emphasizes the Eight Matrkas: and the Eight Bhairavs. In the Kathmandu Valley one can find many temples which possess the relics or struts depicting the Eight Matrkas: Mahalaksmi, Brahmayani (Skt. 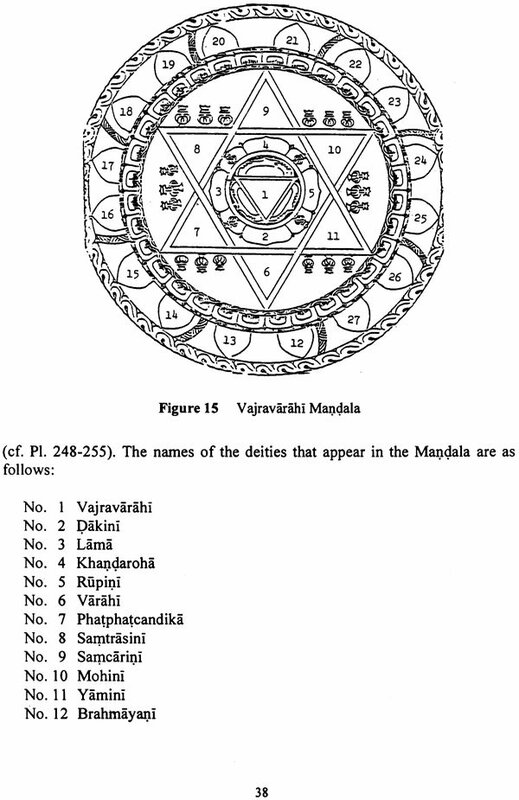 ; Brahmani), Rudrayani (Skt., Rudrani), Camunda, Kaumari, Vaisnavi, Indrayani (Skt., Indrani), and Varahi. 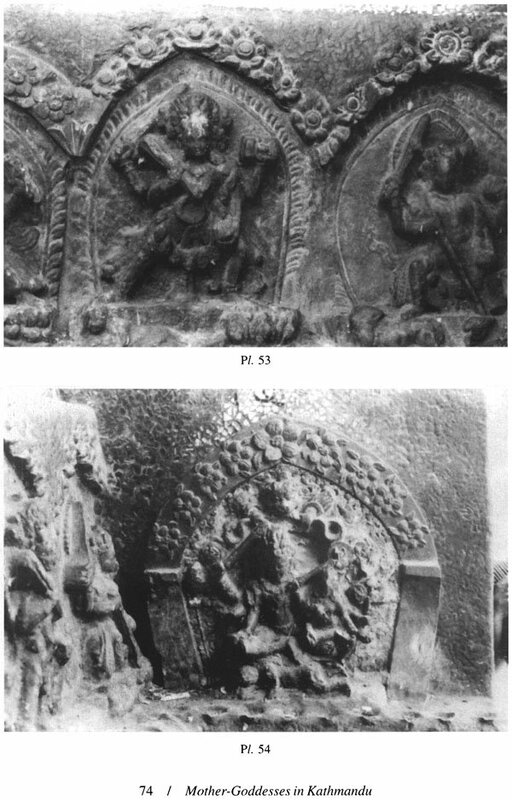 These images have been kept in good condition; the vehicles of the Matrkas can be clearly seen, and most of the symbols held in their hands have been preserved. 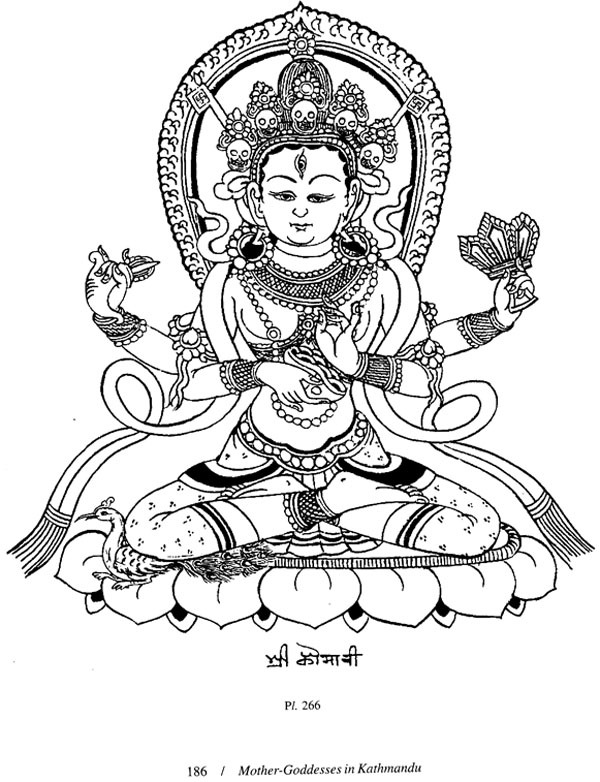 These images can thus furnish materials for Hindu iconography in Nepal as well. The struts depicting the Eight Matrkas are often placed together with the struts depicting the Eight Bhairavs: Asitanga, Ruru, Canda, Krodha, Unmatta, Kapala, Bhisana, and Samhara. One can easily identify each of the Eight Matrkas by recognizing the vechicle, since each Matrka is always mounted on the same type of vehicle. Musashi Tachikawa is professor at the National Museum of Ethnology in Osaka, Japan. (Ph.D., Harvard University ; D. Litt., Nagoya University  formerly taught at Nagoya University (1970-92). His publications include the Structure of the World of Udayana's Realism (Reidel, 1980), Five Hundred Buddhist Deities (Adroit, 2000), Three Hundred Sixty Buddhist Deities (Adro, 2001). This book presents iconographic studies of the Eight Mother-Goddesses (matrkas) in the Kathmandu Valley. The Kathmandu Valley contains over one thousand historical monuments and can be regarded as a huge museum. Niche-shrines, which house popular deities, are found in almost every corner of all the towns in the valley. Statues of Hindu or Buddhist deities are placed in front of the all prominent buildings or in the sanctuaries of temples. A number of religious images or icons can be seen on various parts of buildings such as walls and the tympanums (torana) above the entrances. Statues are also found as part of the struts supporting the roofs. One could say that the Kathmandu Valley, including its three large cities: Kathmandu, Patan, and Bhaktapur, is inhabited by deities. People encounter divine images of icons around homes and wherever they go out within the valley. Moreover, the images of deities are even now-a-days used as the sacred symbols or paraphernalia of rituals, such as worship services to be observed in temples, or festivals to be performed throughout the whole city. Although the national religion of Nepal is Hinduism, a considerable number of Buddhists are quite active in the Kathmandu Valley and the surrounding mountainous regions. Then there are Tibetans who have migrated from Central Tibet for several decades. They continue to try to preserve their own traditions in the city of Kathmandu as well as Patan. Some Newar Buddhists have to follow the Theravada tradition without loosing their identity as Newars. Besides the great traditions of Buddhism and Hinduism, several small tribes observe their own cults in the Kathmandu Valley. Various religions which are closely related can be found in this valley. Two different religions, Buddhism and Hinduism, for example, sometimes share the same icons, or icons with similar features to a considerable degree. It often happens that Nepalese people identify a single image differently according to the religion to which they belong. The iconography of Nepalese Hinduism is essentially the same as that of Indian Hinduism. There are, however, some important differences between them. One of the most important difference is that Nepalese Hinduism emphasizes the Eight Matrkas and the Eight Bhairavs. 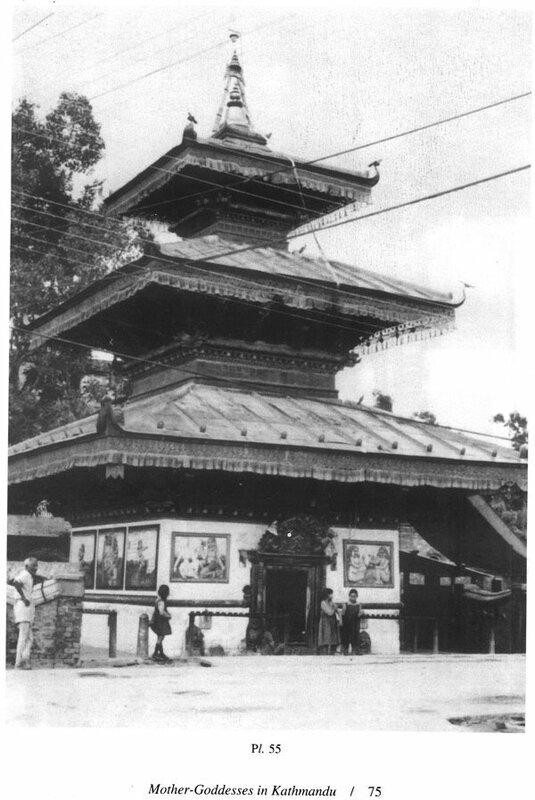 In the Kathmandu Valley one can find many temples which possess the relics or struts depicting the Eight Matrkas: Mahalaksmi, Brahmayani (Skt., Brahmani), Rudrayani (Skt., Rudrani), Camunda, Kaumari, Vaisnavi, Indrayani (Skt., Indrani), and Varahi. 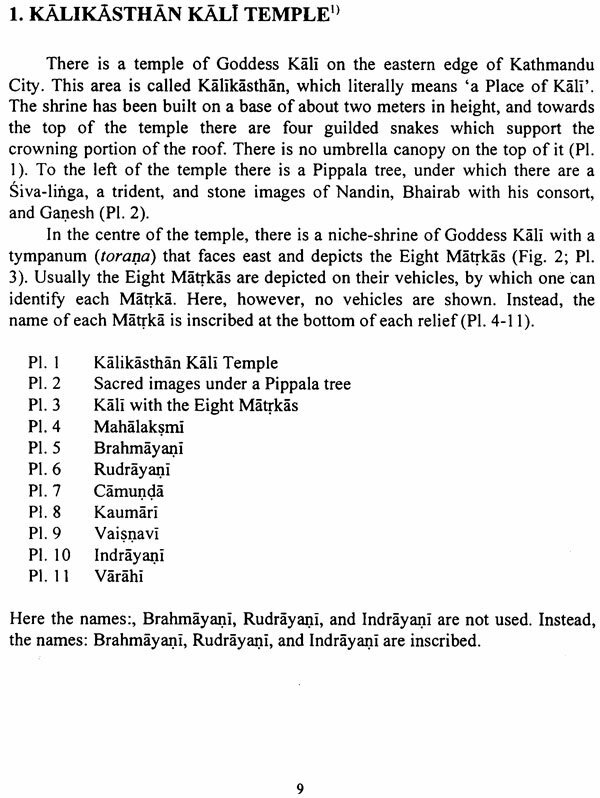 Among the many shrines and temples in the Kathmandu Valley, I have chosen fifteen temples (or shrines) for this study, because they possess the images of the Eight Matrkas. Their images have been kept in good condition; the vehicles of the Matrkas can be clearly seen, and most of the symbols held in their hands have been preserved. 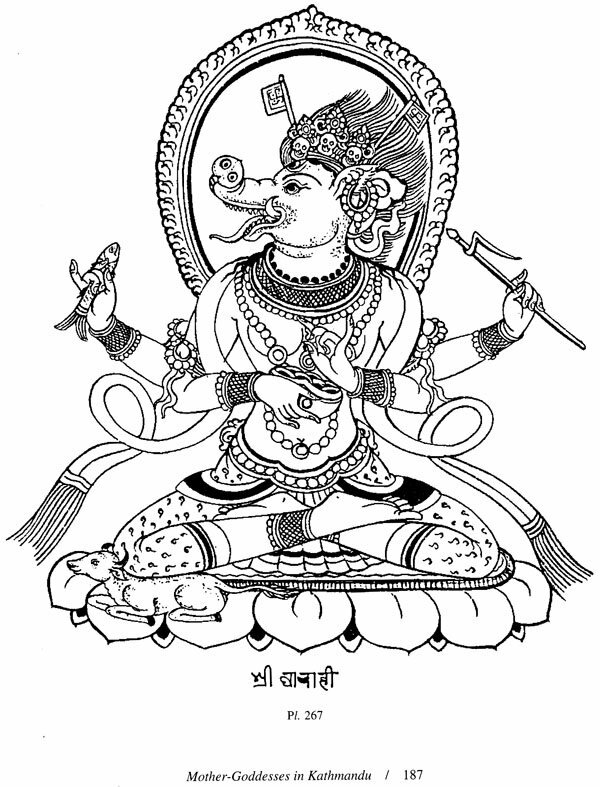 These images can thus furnish materials for Hindu iconography in Nepal as well. The struts depicting the Eight Matrkas are often placed together with the struts depicting the Eight Bhairavs: Asitanga, Ruru, Canda, Krodha, Unmatta, Kapala, Bhisana, and Samhara. 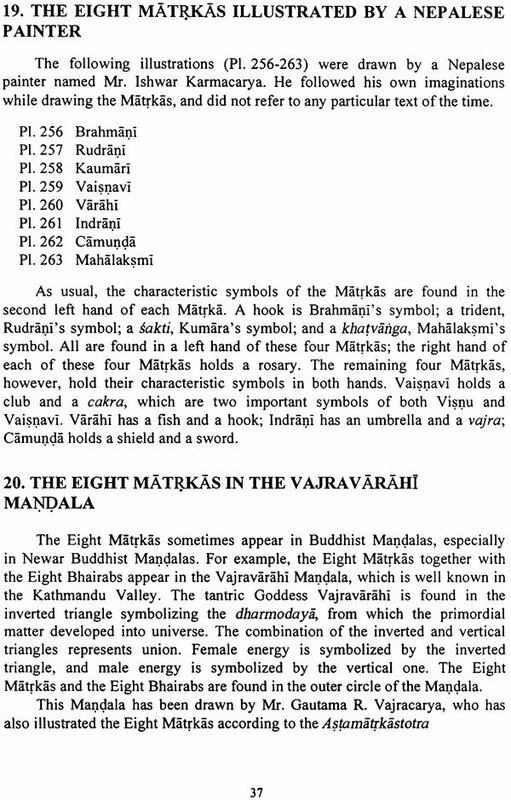 One can easily identify each of the Eight Matrkas by recognizing the vehicle, since each Matrkas is always mounted on the same type of vehicle. One cannot, however, identify each of the Eight Bhairavs in a similar manner. The vehicle of each of the Bhairavs is not consistent or determined, as it is in the case of a Matrkas, The symbols held in the hands of the Bhairavs are not helpful in identifying each Bhairav either. First, I will briefly explain the structure and history of those temples and shrines I have chosen. 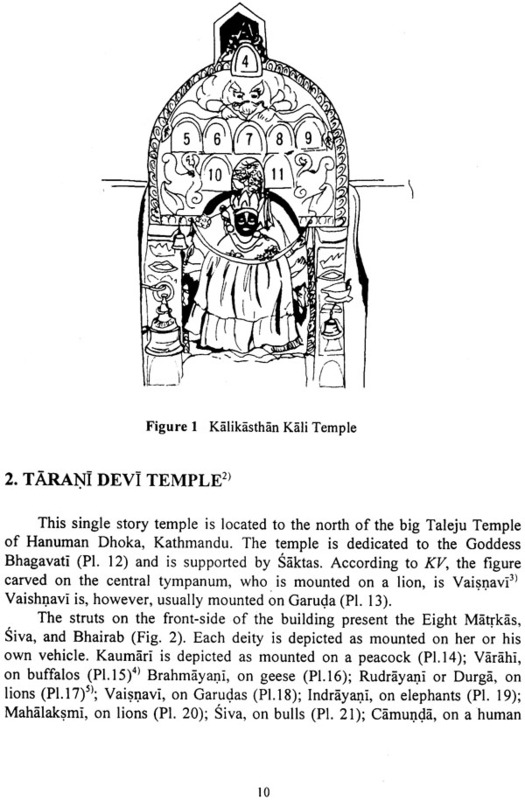 Then I will illustrate the positions of the images of Matrkas and Bhairavs found in each shrine and temple. This is a revised version of my papers entitled' 'Materials for Iconographic Studies of the Eight Mother-Goddesses in the Kathmandu Valley," Part I, Monumenta Serindica, No. 12; A.A. Institute, Tokyo, 1984, pp.I-122; Part 1-2, ibid., 1985. pp. 41-116.